'It Might Get Loud' is released to European audiences this week and Edge has been talking to The Times newspaper in the UK. Read the whole piece here and watch this clip. 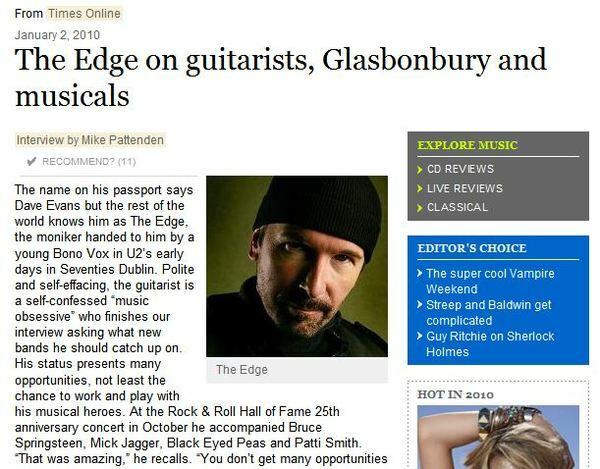 "The Edge" is one of the most creative guitar players on the Planet. In other areas of guitar playing he knows when to keep it simple & when to be complex. He has the greatest imagination for the use of effects wether it is with Rackmount units or Pedals. Never sticks to just the same sound but is always expanding and experimenting with new soundsand techniques which is a big part of why U2 has lasted for almost 3 decades. I know you are just a Person Dave but I hope I can meet you one day and shake the hand of my favorite guitar player. this movie is fantastic !!!! i just got this on dvd, a must see for all guitarists,it was cool seeing them 3 together,edge is just so cool as always and it is always good to hear from him about the guitar,im not a massive jack white fan or a led zepplin one but that could change because clearly they are very good guitarists,mind you ya gotta love a whole lotta love and seven nation army.great great movie. The Jack White dude was totally not needed but the Edge and Jimmy Page excellent! got tickets for belfast premier next fri,cant wait then roll on horsens in aug and seville sep for 360.it cant come quick enough. It Might Get Loud..... PURE BRILLIANCE!! This movie is amazing, I did not stop smiling the whole way through, seen it twice now planning to see it a 3rd time and eventually buy it on DVD. Obviously, I enjoyed The Edge's history the most but Jimmy Page is certainly the guitar master and Jack White, well he is just a laugh :D Everyone should see this movie, recommend everyone to see it if you have, it is sheer brilliance a complete and utter masterpiece!!!!! It Might Get Loud is going to be released in Sweden soon, I'm definitely going to buy it. I really want to see this movie and everybody saying it's so great. But no wonder that it's seems to be absolute amazing, it's amazing guitar players involved in it! I agree....this movie should not be missed. The coolest part of the movie for me was the look on Jimmy Page's face when air guitaring Link Wray's "Rumble." Priceless. Pure fan of the guitar. The most memorable part of the DVD was one of the deleted scenes during Edge's soundcheck. No drums, bass or vocals to drown out the guitar. As a guitarist myselft it was riveting. The narration interaction and vibration of It Might Get Loud whirls around these Three Aficienados...Hey Dorothy your not in Kansas... This movie rocks hard... Awesome collaberation...Thanks for sharing : ). Great movie...how about this sequel? Neil Peart, LM Jr and Tre Cool in "It Might Get Louder in Here." It Might Get Loud . . . in Europe..
Everyone should see this movie. It is amazing. The quote about trying to express the sound in your head is what every guitar player feels.